Details - Formed in 1803, when it left the parish of West Isles. The island is located within the Fundy Islands. The island's northern coastline is on the Passamaquoddy Bay while its southern and western coastline is along the Bay of Fundy.. The only direct land transportation is via a bridge that connects the island to Lubec, Maine. There is a seasonal ferry service which operates between the island and Deer Island. Boundaries - Being the island so named, and other islands to the south and east of Head Harbour Passage, but west of Grand Manan. Details - Formed in 1869, from unassigned land in the parishes of Pennfield and Lepreau. This parish is located in the northeastern part of the county. Boundaries - West by Saint George Parish; north and east by the County lines, and south by a line run true west from the most southern angle of Queens County to the eastern boundary of Saint George Parish. Details - Formed in 1873, from a southeastern portion of the parish of St. Stephen. Boundaries - Commencing in the centre of the channel of the St. Croix River opposite the mouth of Dennis Stream; thence following the centre of said channel down stream around Todds Point, so called, to Oak Bay, and up the centre of the channel of Oak Bay and of Pagans Cove, to where the northern line of lots fronting on northern side of St. Croix River intersects said cove; thence westerly and northwesterly along said line to the Bay Road, so called; thence westerly along said road to Dennis Stream, and thence down said stream to beginning. Details - Formed in 1856, from northern part of the parish of St. Patrick. Boundaries - West by Saint David Parish and Saint James Parish; north by the County line; east by the northern prolongation of the eastern boundary of Saint Patrick Parish; and south by Saint Patrick Parish. Details - Formed in 1816, when it left the parish of West Isles. Grand Manan is the largest island in the county and second largest island in the province of New Brunswick. The island is service by year-round ferry operation which connects to the mainland at the village of Blacks Harbour. Boundaries - Being the island so named and all the islands to the south and east thereof. Details - Formed in 1857, from the eastern section of the parish of Pennfield. This parish borders along the eastern county line which borders with Saint John County and Kings County. Boundaries - West by Pennfield Parish; north by Clarendon Parish; east by the County line; and south by the Bay of Fundy, including Pocologan, New River and Salkeld Islands, and all other islands in front within two miles of the shore. Details - Formed in 1785. This parish is one of the original parishes of Charlotte County. This parish originally included the parish of Lepreau, however the parish of Lepreau was created in 1857. The parish's largest community is the village of Blacks Harbour. Boundaries - Westerly by Saint George Parish and Letang River; north by Clarendon Parish; east by a line commencing at the western bank or shore of the Pocologan River, where it falls into the Bay of Fundy, and running true north to Clarendon Parish; and south by the Bay of Fundy, including The Wolves Islands, and all other islands within two miles of the shore and not included in Saint George Parish. Details - Formed in 1785. This parish is one of the original parishes of Charlotte County. parish's largest community is the town of St. Andrews. Boundaries - North by Saint Croix Parish and a direct line from the Southeast angle of Lot Number 11 granted to James Greenlaw to the most Western angle of Lot Number 20 granted to Francis Welsh; west by the St. Croix River south by Passamaquoddy Bay, and east by the west line of lot number twenty, granted to F. Welsh, including Ministers and Navy Islands. Details - Formed in 1874, from northern sections of the parish of St. Andrews. This parish received modifications in 1881 and 1896. Boundaries - East and South by a line beginning at the most Northern angle of a four hundred and eighty-eight acre lot, granted to Daniel Hill, on Waweig River; thence Southeasterly, along the Northeastern limit of said lot, to the Western angle of Lot No. 3, granted to James McFarlane; thence Northeasterly, along the Northwestern limit of Lot No. 3, to the Northern angle of same; thence Southeasterly, along the Northeastern limit of Lots Numbered 3, 2, 1 and 12 and of Lot No. 13, granted to John H. Armstrong, to the Eastern angle of Lot No. 13; thence Southwesterly, along the Southeastern limit of Lot No. 13, to the Northeastern limit of the grant to William Reading; thence Southeasterly, along the Northeastern limit of the grant to William Reading to the Eastern angle of same; thence Southwesterly, along the Southeastern limit of the grant to William Reading, to the Northeastern limit of the grant to Rachael Mowat; thence Southeasterly, along said Northeastern limit to the Eastern angle of same; thence Southwesterly, along the Southeastern limit of lot granted to Rachael Mowat and of Lots Numbered 9, 8, 7, 6 and 5 to the Northeastern limit of Lot No. 4 granted to Maxwell Lawry; thence Southeasterly along said Northeastern limit of Lot No. 4, to the Eastern angle of same; thence Southwesterly along the Southeastern limit of Lots Numbered 4, 3 and 2 to the Southern angle of Lot 2, granted to Lauchlan Doon; thence Northwesterly along the Southwestern limit of Lot No. 2 to the Southeastern limit of Lot No. 28, granted to Moses J. Greenlaw; thence Southwesterly, along the Southeastern limit of Lot No. 28 to the Northeastern angle of Lot 29, granted to Jesse C. Bartlett; thence Southerly, along the Eastern limit of lot 29, to the Northwestern angle of Lot No. 45, granted to Jesse C. Bartlett; thence Easterly along the Northern limit of Lot 45 to the Northeastern angle of same; thence Southerly, along the Eastern limit of Lot 45, to the Northern limit of the hundred acre lot granted to Andrew Dougherty; thence Easterly, along the said Northern limit to the Western bank or shore of Bonaparte Lake; thence Southerly, along said bank or shore, to meet the Northerly prolongation of the Eastern limit of Lot No. 4 granted to Leonard Bartlett; thence Southerly along said prolongation and said limit to the Northern limit of Lot No. 3 granted to Thomas Sime; thence Westerly along said Northern limit to the Northwestern angle of Lot No. 3; thence Southerly, along the Western limit of Lots Numbered 3, 2 and 1 to the Southeastern angle of Lot No. 11 granted to James Greenlaw; thence Westerly, along the Southern limit of Lot No. 11, to the Eastern bank or shore of Little Chamcook Lake; thence Southerly along the Eastern bank or shore of Little Chamcook Lake and the Eastern bank or shore of Fry Mill Stream to the bank or shore of Chamcook Lake; thence Southerly, Westerly and Northerly along the Eastern, Southern and Western banks or shores of Chamcook Lake to the Northern limit of the five hundred acre lot granted to Colin Campbell, Thomas Wyer and William Gallop; thence Westerly, along said Northern limit, to the Eastern limit of lots fronting on the St. Croix River; thence Southerly along the Eastern limit of lots fronting on the St. Croix River to the Southeastern angle of Lot No. 38 granted to Daniel Grant; thence Westerly along the Southern limit of lot 38 to the St. Croix River; West by the St. Croix River and Saint David Parish, North by Saint David Parish including Rickets Island in Waweig River. Details - Formed in 1785. This parish is one of the original parishes of Charlotte County. Boundaries - South by Dufferin Parish; west by the east line of lots on Dennis Stream prolonged southerly to Dufferin Parish and by the west lines of the grant to Henry Goldsmith and others; north by the north line of the said grant; east by the east line of the said last mentioned grant; southeast and southerly by a line commencing at the most northern angle of a four hundred and eighty-eight acre lot granted to Daniel Hill on Waweig River; thence southwesterly to the most western angle of the said lot; thence southeasterly to the northeast angle of lot number thirty, granted to W. Ross; thence westerly along the north line of the said last-mentioned grant and its western prolongation to the northeast angle of lot number eight, granted to James Garcelon; thence south to the southeast angle of lot number four, granted to James Christie; thence west to the southwest angle of the said last-mentioned lot; thence south along the eastern line of lots fronting on Oak Bay to Waweig River; thence down the channel of Waweig River and up the channel of Oak Bay to Pagans Cove, where the northern line of Dufferin Parish intersects it, excluding Rickets Island in Waweig River. Details - Formed in 1785. This parish is one of the original parishes of Charlotte County. The parish's largest community is the town of St. George. The Magaguadavic River passes through the town of St. George. Boundaries - West by Saint Patrick Parish, Dumbarton Parish and Passamaquoddy Bay; north by the County line; east by the rear line of lot number three, granted to William Payne and its prolongation northerly to the County line, and southerly to Letang River; south by the Bay of Fundy, the channel to and through Letete Passage, and the channel to and through Letang Harbour and River, including Bliss Island. Details - Formed in 1823, from north sections of the parish of St. Stephen and unassigned land. The western boundary of this parish border with the United States. Boundaries - South by Saint Stephen Parish and Saint David Parish; east by the northerly prolongation of the east line of Saint David Parish; north by the County line; and west by the St. Croix River. Details - Formed in 1785. This parish is one of the original parishes of Charlotte County. Previous to the establishment of the parish of Dumbarton, this parish stretched as far north as the county line. Boundaries - West and northwest by Saint Andrews Parish and Saint Croix Parish; east by the west line of the grant to Philip Bailey and others, and its northerly prolongation; north by a line commencing at the most southern angle of lot number five, granted to John Gilman, on the southwestern side of Digdeguash River; thence northeasterly along the southeasterly line of said lot to the Digdeguash River; thence down stream along the same to the lower line of the lot granted to John Campbell; thence along the same easterly to the rear thereof; thence northerly along the rear of the said last mentioned lot to meet the westerly prolongation of the line dividing the lots ten and eleven in the Clarence Hill grant plan, and thence easterly along the said line dividing the lots number ten and number eleven to the eastern boundary of the parish; and south by Passamaquoddy bay, including all the islands west of the east line of the said parish within two miles of the shore. Details - Formed in 1785. This parish is one of the original parishes of Charlotte County. parish's largest community is the town of St. Stephen, which is the largest municipality in the county. The St. Croix River passes along the town of St. Stephen. Boundaries - South by Dufferin Parish and the St. Croix River; east by Saint David Parish, north and west by a line beginning in the intersection of the St. Croix River with the southwesterly prolongation of the northwestern limit of Lot No. 16, granted to Angus Rankin; thence northeasterly along said prolongation and said limit to the western limit of Lot No. 115, granted to Thomas Dodd; thence northerly along the western limits of Lots Numbered 115, 116, 117 and 99 to 114 inclusive to the southern limit of Lot No. 46 granted to Thomas Grimmer Junior; thence westerly along said limit and its prolongation to the eastern limit of Lot No. 60, granted to Robert M. Todd; thence northerly along the eastern limit of Lot No. 60 and its northerly prolongation, to meet the westerly prolongation of the northern limit of No. 53 granted to Peter Christie; thence easterly along said westerly prolongation, the northern limit of Lot No. 53 and the easterly prolongation of the northern limit of Lot No. 53, to the eastern bank or shore of Moore Lake. Details - Formed in 1785. 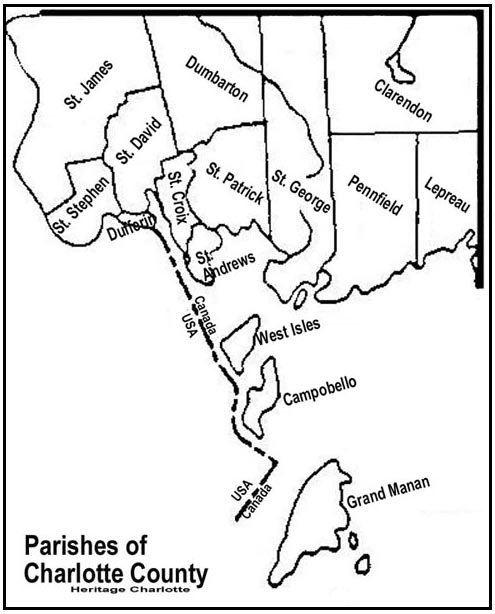 This parish originally included all of the Fundy Island, however Campobello was assigned its own parish in 1803 and Grand Manan assigned its own parish 1816. The islands of Moose, Dudley and Frederick were transferred to the United States in 1817. Today, the parish includes Deer Island and any of the outlaying inhabited islands. Deer Island is serviced by a year-round ferry service to the mainland. Boundaries - To consist of Deer Island and the lesser islands contiguous to it, not included in the parishes before-mentioned. For quick searches, use "ctrl+F" and enter the name of the community that you wish to reference. Click Here to open the 'Parishes of Charlotte County' map in a new window.